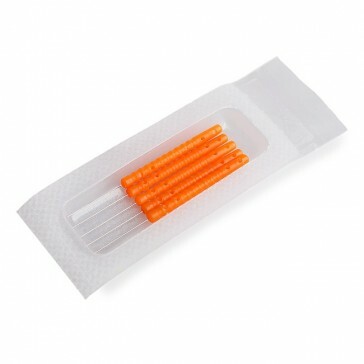 This new sterile, DBC needle is 13mm in length with a highly visible plastic orange handle. 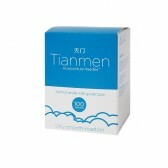 Suitable for general and facial acupuncture, this needle is also great for those using the NADA protocol. The bright orange 25mm handle makes this needle easy to locate during removal or if dropped on the floor. Manufactured in an automated facility, this needle features consistency and quality unrivaled by other needles in the market. 5 needles per blister package. Box of 500 needles. DBC needles are the highest quality Korean needles on the market and renowned worldwide for their smooth painless insertion. 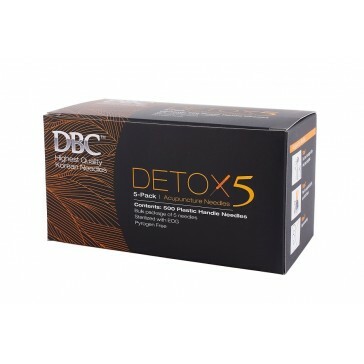 All DBC acupuncture needles are made from the best surgical-grade stainless steel and sterilized with Ethylene-Oxide Gas (ETO) in strict compliance with CE Marking, ISO 9002, British Q-mark, and 510K certification from the United States FDA and WHO (World Health Organization) guidelines. DBC acupuncture needles are made with machine-controlled precision to ensure every needle is finished to the highest quality. The grinding and polishing processes are automatically controlled and have no human intervention, thus ensuring excellent consistency. DBC needles have a micro polished high-tech coated body and optimized needle tip to geometrically ensure smooth painless insertion. DongBang Corporation is one of the largest acupuncture manufacturers in the world and fully committed to innovation and the continuous support of worldwide academic research in acupuncture. These needles are for use only by qualified / registered acupuncturists.